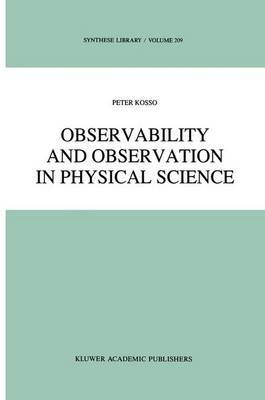 The concept of observability of entities in physical science is typically analyzed in terms of the nature and significance of a dichotomy between observables and unobservables. In this book, however, this categorization is resisted and observability is analyzed in a descriptive way in terms of the information which one can receive through interaction with objects in the world. The account of interaction and the transfer of information is done using applicable scientific theories. In this way the question of observability of scientific entities is put to science itself. Several examples are presented which show how this interaction-information account of observability is done. It is demonstrated that observability has many dimensions which are in general orthogonal. The epistemic significance of these dimensions is explained. This study is intended primarily as a method for understanding problems of observability rather than as a solution to those problems. The important issue of scientific realism and its relation to observability, however, demands attention. Hence, the implication of the interaction-information account for realism is drawn in terms of the epistemic significance of the dimensions of observability. This amounts to specifying what it is about good observations that make them objective evidence for scientific theories.